Remember how hard it was to keep a secret as a kid? Imagine if you were told you were going to play a major character in the next Charlie Brown movie but you weren’t allowed to tell anyone for a year? Thirteen-year-old Medford Memorial Middle School eighth grader AJ Tecce found himself in this position in the summer of 2013, after he sent in a recording from his mother’s iPhone to a casting audition for Charlie Brown. He received three calls to go to New York to read for the movie after sending that video. The third time he went to New York, the crew asked him to also read for Pig Pen, so he looked over the lines for a bit, and also partook in that audition. It wasn’t until the following summer after the initial audition that everything was official and he signed the contract. AJ was told he had to keep the secret until last Thanksgiving, when all of the characters appeared on the “Today” show for a cast reveal. The group started recording the voices of the animated characters for the movie in November 2014, and finished this past summer. All of AJ’s recordings were done at Soundtracks Studio in New York City where he traveled five or six times to record for Pig Pen. During these recording sessions, AJ’s director, Steve Martino, would describe the scene and let AJ look over some lines. They would then both work through them, trying things different ways, so the animators had some dialogue to work with. He also did some commercials and promotional recordings during his sessions at Soundtracks Studio. Though this was by far the biggest project he ever worked on, he said he was comfortable because of Martino. “It was great to work with Steve. He taught me so much about really using my voice to act, so our recording sessions were a lot of fun. He was so easy to work with, so I never really got nervous,” AJ said. Acting is a skill AJ picked up rather easily at a young age and has ran with it for about 10 years. It started as something fun to do to pass the time while his three older brothers were in school. AJ’s unique personality was one that was not hard to recognize at a young age, and it wasn’t long after his mom contacted an agent that AJ was off auditioning for different roles. “I really like the different people that you meet. Every role is different and that keeps things fun and exciting,” AJ said. “He had a very outgoing personality at a young age, which is half the battle with young actors. He was very comfortable separating and going into casting offices with strangers, and took direction well,” his mother Karen said. Though Tecce knows things will start getting more complicated as he transitions into high school and more commitments, she believes AJ will stay involved with acting as long as it is still fun for him. “We are going to follow his lead,” Tecce said. The experience of being in a Hollywood movie that is in theatres across the country as a 13 year old will be an experience AJ can take with him for years to come. “We are very proud of AJ and how hard he has worked over the years. Going to auditions can take up a lot of time, and he has missed things that were important to him to go to auditions for jobs he never got. In this business, there is more rejection than success, and luck plays a very big part in getting a role. I think we all realize how fortunate he was to have had this experience and are grateful for the opportunity,” Tecce said. AJ has taken a remarkably unique path directly from Memorial Middle School’s “Homeroom Headlines” show straight to the big time. In fact, he returned from Hollywood last week after flying out for the red carpet premiere of the movie where he posed for cast pictures and was introduced to the media. AJ walked the red carpet for pictures and did interviews with reporters. He also attended the big pre-premier party where there was a Charlie Brown house with real snow, and a football field where you could try to kick the football and not miss, as Charlie Brown is famous for doing. The cast also got to meet and take pictures with Meghan Trainor, who has a song in the movie. 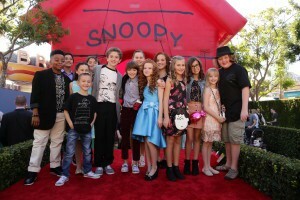 The crew then got to see the movie for the first time in 3D, and the following day they got to go to Snoopy’s Hollywood Walk of Fame Star Ceremony. “I felt like a celebrity! When we got off the ‘Peanuts’ bus at the premiere, there were a lot of people calling out our names and asking for autographs. I couldn’t believe that people knew my name and had pictures of me,” AJ said.